If you are short of time, the answers to the following 3 questions should let you know all you need to about the ProtectiveClean 6100. If you want more detail, you can read our full Sonicare ProtectiveClean 6100 review further down the page. The ProtectiveClean 6100 is an upper mid-range electric toothbrush that offers more than just the core functions of a toothbrush. There is far from anything wrong with it, in fact trying to find fault is very difficult. Most importantly it delivers a fantastic clean to the teeth and gums. My criticism is that for most, this brush offers more than what is needed. The answer to this question depends on whether you want more or less from the brush. The 6100 gives a bit more than the more entry level, but perfectly capable Sonicare 4100, but does not boast the same impressive feature set as the DiamondClean Smart. Much more expensive the DiamondClean Smart is, the 6100 is a balance between features and price. We compare the entire ProtectiveClean range in our Sonicare 4100 vs 5100 vs 6100 post, or for a more detailed comparison of all buying options, see our electric toothbrush top 10. 3. Where’s the best place to buy the ProtectiveClean 6100? Our recommendation is typically Amazon as the best outlet to buy from. Swift nationwide delivery and competitive prices make it hard to beat. Below we have included a price comparison table with a few different choices, and it’s always worth checking out eBay, too. Buy from a store you are happy to shop at. Of the 3 different models available within the ProtectiveClean range (at the time of writing) the 6100 is the most feature rich and perhaps unsurprisingly the most expensive. Although the more expensive of this range, it is still roughly half the price of the top of the line models Sonicare produce and has a lot to offer. Multiple cleaning modes, a travel case and clever brush head detection technology add a cutting edge and convenience to this electric toothbrush. Technically the toothbrush handle and what it offers are exactly the same with all 3 variants, but what changes is the color of the brush handle. The different color options mean a different Sonicare part code too. Depending on which color is your preference, may well depend on the availability. Silver White and Pastel Pink appear to be the most widely stocked. In this hands on review I have been testing the Silver White color option. Having spent several weeks testing the ProtectiveClean 6100, here are what I consider to be the pros and cons. Design – Comfortable to hold, the brush comes in several smart color choices. 3 cleaning modes – A choice of cleaning modes to achieve the cleaning results you want complete with LEDs to clearly show the mode selected. Brushing intensity – Change how intense the power delivered to the brush head is. BrushSync – A system that alerts you when it is time to change your brush head, but also selects the most appropriate cleaning mode for the brush head fitted to the handle. Battery life – Exceeded expectations. Travel case – A protective plastic case to protect the brush head and handle when travelling. BrushSync – To take full advantage of the BrushSync feature you need to buy additional brush heads. Brush head price – New ‘BrushSync’ compatible heads are more typically more expensive. The ProtectiveClean 6100 feels similar to Sonicares most premium model available at the time of writing, the DiamondClean Smart. It boasts, some but not all of the features of the Smart, but is as a result a cheaper alternative. It is clear when you handle the 2 side by side that the DiamondClean is the more premium, but technology once reserved for the most premium of models, BrushSync, has been placed in the ProtectiveClean. I will explain this in great detail shorty, but let’s take a closer look at the brush handle first. It has a fairly typical electric toothbrush look and design to it. It is a little busier on the front than some otheres, because of the features it offers. At the time of review it comes in 3 different color options, White Silver (the version I have been testing), Pastel Pink and Navy Blue. Color aside, technically they are all the same. Like most Sonicare models this feels great in hand. Solid, well built, with a premium feel too it. Slim enough that it is not chunky, but large enough you can get a good grip to hold onto it. For some, the lack of rubber grips and contours in the body shape might make grip an issue, but for the most part, the matt paint finish to the plastic actually sticks to the fingertips really well. It does not feel like it wants to slide out of the hand like some brushes with glossier finishes do. Placed somewhere between a third of the way and half way down the brush handle are 2 buttons. The upper button is the power button, this turns the brush on and off. The lower button is the cleaning mode/intensity button. A power symbol is embossed onto the concave rubber button and makes for a natural place to rest the thumb. The cleaning mode/intensity button has no icon on it and is smooth to the touch. The buttons are relatively easy to press with a bit of feedback. In between each button are 3 LEDs, horizontally aligned. They get slightly bigger from left to right. These are the LEDs that show the intensity (or power) of the motor. I will explain more about these very shortly. The panel is Silver in color and contrasts against the handle body color. Both the Pastel Pink and Navy Blue handle have this same Silver panel. Both the power and cleaning mode button are color matched to the handle. Sitting below those buttons and Silver panel are the LEDs and names of the 3 cleaning modes available on the 6100. The LED sits above the cleaning mode name. Right towards the bottom of the brush handle are a further 2 LEDs and icons. The LED for the battery lights up and flashes in a few different ways. Check out the ‘Battery Life’ section of this review for more information on that. The back of the handle is smooth to the touch. No ridges or extra grips, with the exception of a little protrusion at the bottom of the handle. It seems a bit out of place and not immediately obvious what it is for. But, lay the brush on a flat surface, and this raised moulding stops the brush rolling about. Genius! On the base of the brush handle is a recess into which the prong on the charging stand fits. The brush will sit upright on a flat surface and does too sit upright on the charging stand. Fitted inside the brush handle is the Lithium-Ion (Li-Ion) rechargeable battery, that offers an absolute minimum of 2 weeks of usage times and the motor that delivers a maximum 31,000 strokes per minute. The handle is water resistant and can survive toothpaste, saliva and a rinse under the tap. Sonicare suggest not to use it in the shower. At the top of the brush handle extends a metal shaft that feeds out from the motor inside. This delivers the sonic movement to the interchangeable brush heads. Analyse the brush side on and you will see how the brush head fits on at a very slight angle. Slight it might well be, but it helps angle the brush head for a better reach towards the back of the mouth. A subtle, but important design feature that enhances the overall usability. Each brush head simply push on and pulls off of the brush handle. The heads fit over the metal shaft at the top. You can usually feel it clip into place. Supplied in the box is 1 x W DiamondClean brush head. This particular style of head is to help with Whitening the teeth and polishing them up. It works well with the ‘White’ cleaning mode on offer on this brush. What makes the 6100 particularly special is the ‘BrushSync’ technology that is built in. There are 2 parts to this technology, there is the BrushSync replacement reminder and the BrushSync mode pairing. Mode pairing is not found on the cheaper 4100 and 5100 ProtectiveClean models, but they do have the brush head replacement reminder feature. As the BrushSync mode pairing name kind of implies, the brush automatically selects the appropriate cleaning mode and intensity based on the brush head attached. This means that if you fit the DiamondClean head to the handle, it will automatically select the White cleaning mode. Although not supplied in the box, if you were to buy and fit the C2 Optimal Plaque Control brush head to the handle, it would pair with the ‘Clean’ mode whilst the G2 Optimal Gum Care brush head will pair with the Gum Care mode. The idea of this pairing is to achieve the best cleaning results possible. Personally I think it is clever, but I have never really thought, wow this is a lot of effort changing the cleaning mode…but I can see the convenience it brings and for those serious about their oral health, investing in additional brush heads is suggested. How it works is that both the brush handle and brush head have to be BrushSync compatible. You see, inside a BrushSync compatible brush head, is a small microchip. When the BrushSync compatible handle, such as the ProtectiveClean 6100 detects this chip, it makes the necessary alterations to the cleaning mode for you. As I mention, BrushSync is made up of 2 parts, the other being the brush head replacement reminder system. What this does is tell you, via an LED on the brush handle when it is time to change or replace your brush head. When a brush head is fitted to the brush handle for the first time, the chip is detected and the warning light will flash 3 times. This acts as confirmation that the handle has detected the head and that the electronics inside the handle will now keep track of it. The handle knows that the brush head should be replaced every 3 months. So, once the handle detects that the brush head has been used for this amount of time, the ‘BrushSync’ LED on the brush handle will light up an Amber/Orange color. It is at this point you should fit a new head. If it detects you have brushed 3 times a day every day or brushed with more pressure, it will activate the BrushSync alert sooner, as the bristles will have worn out sooner than the typical 3 month time period. It will too delay alerting you to replace the brush head, if you used that head just once a day over 3 months. It would not tell you to replace it until it had been used for equivalent to 4 minutes a day for 3 months. Both elements of the BrushSync technology are designed to make your life easier and more convenient. I want to make it clear that as clever as this technology is, you need to be aware of the different brush heads because there is a lot of choice. If you want to have BrushSync work, you need to use a compatible brush head. Not all the brush heads Sonicare make have the microchip built in. When any of these are fitted to the handle of the 6100, they will be tracked and the appropriate cleaning mode selected. There are then a series of ‘standard’ brush heads that are similarly named, but do not have the microchip in and are not BrushSync compatible. It is perfectly possible to use a standard brush head on the 6100 as it is perfectly fine to use a BruchSync compatible head on a handle that does not offer BrushSync technology. But, do be aware, the BrushSync will only work when a compatible head is used on a compatible handle. We cover brush heads in more detail in our guide to sonicare brush heads. Like all new technology, it comes at a premium. To be fair, the prices have dropped since the tech was first introduced in 2017, but it would be nice to see further drops to help keep running costs down. Prices vary from one store to another. I have found them as low as $8 per head, but as high as $15 if being sold at full retail price. An average price is around $12 per head. A normal brush head, that is not BrushSync compatible is on average $8. It is worth noting, as great as all the electronic technology is, all Sonicare heads have Blue fading indicator bristles. Over time and use they fade to a very pale almost White/Translucent color. When they are this color, it is time to change the head. It is a more basic, yet effective alternative to the BrushSync brush head replacement reminder system. Despite each compatible head having predetermined cleaning modes you can override these at any point to something that suits you better. The 6100 offers 3 cleaning modes, Clean, White and Gum Care. We have written more about all of Sonicare’s brushing modes here. It also has 3 different brushing intensities to choose from, Low, Medium and High. A 2-minute mode. It gives you a thorough and complete clean and is recommended to be used with the C2 Optimal Plaque Control brush head. A 2-minute 30-seconds mode. 2 minutes for normal cleaning and 30 seconds to polish the front teeth. Recommended to be used with the W2 Optimal White brush head. A 3-minute mode. 2 minutes of normal cleaning and 1 minute to clean and stimulate the gums. Recommended to be used with the G2 Optimal Gum Care brush head. To chose the mode you want, you first need to press the cleaning mode button on the brush handle until the LED above the desired cleaning mode is lit. You can continue to cycle through the modes by pressing that button. Once selected, power the brush on and the cleaning mode is set. That cleaning mode button now controls the intensity, or power of the clean delivered. You can press it multiple times to cycle through, low, medium and high. The LEDs below the power button will light up. Depending on the mode selected and the intensity, well depend on how many of the maximum 62,000 movements (31,000 brush strokes) per minute are used. There is a clear difference between each intensity. You can hear it in the sound emitted from the motor and in the cleaning sensation. In many respects, you could suggest you have a total of 9 different cleaning options on the 6100, more than enough for most people. Whilst Clean is the default, go to option, the Gum Care mode works well for those suffering with or recovering from gum disease, or those who are generally more sensitive to the power the electric toothbrush delivers. Both a 2 minute timer and quadpacer are in my opinion essential and the 6100 has both features built in. Dentists recommend a 2 minute cleaning cycle, this is offered by the Clean mode. However, whilst cleaning your teeth for 2 minutes is important, it is also important to pay equal attention to the areas of your mouth. Not much good cleaning just the front teeth if you want good oral health. During the standard cleaning cycle, at 30 second intervals the brush motor pauses briefly. This stops the cleaning action and pauses the humming sound and vibration from the handle. It is this pause that alerts you to the fact that it is time to change quadrant. You spend 30 seconds cleaning each section, that way over the 120 seconds (2 minutes) of brushing time, you will give a relatively even clean to the teeth and gums. At the end of the cleaning cycle, the brush automatically turns itself off to signal the end of the clean and conserve power. Of course both the White and Gum Care mode run for longer. When using these modes, the timer and pacer still functions, for 2 minutes, but after this time the pacer stops. The brush will turn the 6100 off after 2 minutes and 30 seconds when the White mode is selected and 3 minutes when Gum Care mode is in use. The timer is a very useful feature for all users. For new electric toothbrush users, the ProtectiveClean has a couple of extra clever features. EasyStart is a system that gently increases the power over the first 14 brushings to help you get used to brushing with the ProtectiveClean 6100. The full 62,000 movements (31,000 brush strokes) per minute can seem quite intense on first use. EasyStart eases you in and makes the transition from manual to electric brushing easier. Another feature that is aimed at all, but particularly useful for new users is the built in pressure sensor. Brushing too hard can damage the teeth and gums, not to mention wear out the brush heads sooner. Bristles need only skim the tooth surface to remove plaque and debris. The sensor will kick in every time it detects the excess force being used. The handle vibrates to alert you when too much pressure is being applied, the brushing sensation and sound changes too. I particularly like the visible pressure sensor available on the DiamondClean Smart and Oral-B’s model range. I think the light it more obvious, particularly when most of us tend to brush in front of a mirror. The BrushSync replacement reminder LED flashes Amber when the sensor is activated. Given its position, it is not the easiest to see. Although you should notice the vibration and different brushing sensation. Within a few days, you will likely get used to how much pressure is appropriate. Wishing not to preach to electric toothbrush newbies, but something often misunderstood is actually how to brush your teeth. Yes, as silly as it might sound, the approach you take with an electric toothbrush is different to a manual one. You should not move the brush head back and forth in a rapid manner as you might with a manual brush. You move the head from tooth to tooth, the motor and bristles do the work. You should too hold the brush head at a 45 degree angle to the teeth and gumline. Refer to the instruction booklet that comes in the box with the ProtectiveClean and spend time learning how to brush your teeth correctly. Get this right and you are really helping yourself achieve better oral health. In the box with the 6100 is a travel case. Made from a thick plastic, the case is hinged on the left side with a clip on the right to securely fasten it shut. The case holds the 6100 brush handle and up to 2 brush heads. Not only will it stop the handle or heads getting damaged, it also stops any accidental activation of the brush. The White Silver brush comes with a White travel case as does the Pastel Pink variant. These have a White charging stand too. The Navy Blue option has a Black travel case as well as a Black charging stand. The color of the provided brush head is also Black compared to the White on the Pastel Pink and White Silver version of the 6100. The 6100 is a very capable electric toothbrush, make no qualms about it. It offers more features than most of us need, but many nice features that offer convenience and are to be expected in the technologically advanced world we live in. The core function is to clean the teeth and it does a simply fantastic job of this. The different cleaning modes help tackle different user needs, but the 3 cleaning intensities gives an extra level of control for user that is welcomed, albeit I am not sure how often you will adjust these. My teeth have felt wonderfully clean after brushing. The heads on the brush are a little larger than the likes of Oral-B brushes and make for a little tricker task reaching the very back teeth, but certainly not a make or break factor for most. There is clinical evidence that sides with both brands, but the reality of the situation is either are very good. The 6100 is great and offers a lot, but for me it feels like it is stuck somewhere in the middle of the Sonicare range. Sure, it will serve many users well. But, I just can’t help feel that; some will seek the more cost effective ProtectiveClean 4100 and 5100, but those that want more features and box contents, will be prepared to spend even more, to get models like the Sonicare DiamondClean or DiamondClean Smart, or perhaps Oral-B’s Genius Pro 8000 that have a few extra bells and whistles. I can’t decide for you, but hopefully this review helps guide you to make the decision that is right for you. Built into the brush handle is a rechargeable Lithium-Ion (Li-Ion) battery. It is not user removable as the brush is sealed to achieve a certain level of water resistance. The battery is recharged via inductive charging. In the box comes a charging stand, with a US power adapter wired into it. On the top of the stand is a prong that fits into the recess found on the base of the brush handle. No physical wires connect between the brush handle and the charging stand. Coils in both transfer an electromagnetic charge between the 2. It can take up to 24 hours to fully recharge the battery. The LED indicator on the brush handle provides useful feedback to let you know when the brush is charged and when it needs charging. When first placed on the charging stand, the charger will emit 2 short beeps to confirm that the handle is placed properly. The flashing light of the battery level indicator shows that the toothbrush is charging. When the handle is fully charged, the battery light goes a solid Green for 30 seconds and switches off. The stand itself has built in support for voltages ranging from 100-240v. Whilst the higher end voltage support is not needed in the USA, should you travel and need to take the charging stand, you will need only a plug adapter and not a voltage adapter too. This is great if you find yourself in countries in Europe for example. Depending on how long you travel for will depend upon whether you need to take the charging stand at all. Sonicare suggest that the 6100 offers up to 14 days of battery life. The fact of the matter is, my hands on testing achieve 20 days, just shy of 3 weeks on the most power hungry Gum Care mode. Change to the shorter Clean mode and I achieved a staggering 5 weeks between charges. It is safe to say 2 weeks is a bare minimum you might get from the handle. The different cleaning modes and intensities all have a bearing on how long the battery will last for, therefore everyone’s usage will be a little different. Sonicare have a tendency to over deliver in this area, but I didn’t expect the variance from their claim to actual performance to be so great. Oral-B’s equivalents at this price point offer a maximum of 12 days, so Sonicare trumps here for battery performance. Regular travellers, who perhaps spend a few nights away for business or pleasure can rest easy knowing that you won’t need to take the charging stand with you every time. When not in use, generally speaking it is ok to leave the brush sat on the charging stand, getting topped up. However, if you can keep it unplugged and not constantly charging, there is the potential, longer term that it can be better for the battery. As you might well expect, the features that are built into this brush do not come for free and there is a premium to be paid over the lesser featured ProtectiveClean 4100 and 5100. Philips offer a suggested retail price of $129.99, but the good news for you and I is that even within a few weeks of launch, the price that retailers are selling this at is actually around $110. A $20 saving is better than nothing. There are a few dollars difference between each retailer, but all are within about $5 of each other. So whether you buy from Target or Walmart you can buy with relative confidence, knowing you are not missing out on a much cheaper price. We have listed a price comparison table for the 6100 here. A potential downside, for the time being is the ‘BrushSync’ feature does mean that compatible brush heads are a little more expensive. A single ‘BrushSync’ compatible head can cost as much as $15 each or as little as $8 per head. As an average you can expect to pay $12. Compared to a more standard brush head, without BrushSync compatibility this is a $4 premium, per head. Whilst this might not be huge price difference, over the course of several years, you will be surprised how much you can save by shopping smart for brush heads. You could be looking at best part of $50 back in your pocket! I would advise you bulk buy the heads when the price is low to get the best deal. A typical working life of an electric toothbrush is normally 3-5 years. Many will in fact last a lot longer, with good care. With a cost of $110 for the brush then the additional cost of 11 brush heads at $12 each, the total ownership cost for the 6100 is $242 or $0.22 per day. Grab BrushSync compatible heads for the good price of $8 each and you could potentially bring that ownership cost down to $198 or $0.18 per day. Whilst there are some reasonable differences between the ProtectiveClean and the Oral-B Pro 6000, I believe the 2 to be fairly well matched in features and price point. Oral-B’s Pro 6000 does work out at around $0.15 per day, but replacement brush heads are on average just $5 each. You don’t get the same BrushSync features or quite as good battery life, but you do get a brush head storage compartment and Bluetooth connectivity. 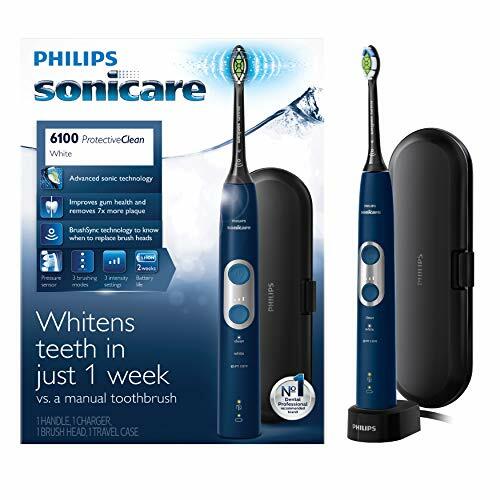 The price is higher but you may even consider models like the Sonicare DiamondClean Smart or Oral-B Genius Pro 8000 that offer even more features such as in case charging and additional box contents. If you are particularly keen to get extra value from the brush, then share the handle with another family member (remember to change brush heads) and you could bring the ownership cost down. Sonicare appear to be pretty reliable on the whole. The international brand has many years experience and feedback from many millions of products sold to develop the ProtectiveClean reviewed here today. It looks and feels solid in hand with no obvious weak spots or design features that immediately have me concerned. Parts of the body fit tightly together, the plastics are of a good standard and buttons feel good and responsive to the touch. By the very nature of a mechanical, electrical product, things can go wrong and a few users will over the working life likely run into an issue, but the likelihood of you being affected is slim. Any electric toothbrush that is reviewed by Electric Teeth is assessed as best as possible to look for possible reliability and performance issues, but do not undergo any specialist testing, we leave that to the manufacturers. The 6100 does come with a 2 year manufacturer warranty, should anything go wrong. This will cover mechanical defects, not user damage but hopefully brings extra peace of mind. Register it online shortly after purchase and extend that warranty by 6 months at no extra cost. There is a great deal to like about the ProtectiveClean 6100. This is far above your basic electric toothbrush offering far more than you need, but with features that are certainly desirable. If you need and want the features it offers, its not bad value, but my experience has taught me most don’t want these features or can’t justify the expense, therefore models like the ProtectiveClean 4100 are all round better value. Those who do want features and can justify the cost, quite often want even more. This therefore makes models like the DiamondClean Smart a more obvious purchasing decision. Far from a bad brush, the 6100 will serve you well. Is the ProtectiveClean 6100 an oscillating brush? How many cleaning modes does the ProtectiveClean 6100 have? The 6100 has just 3 cleaning modes. Clean, White and Gum Care. The brush head supplied with the 6100 is the W DiamondClean, just 1 from a wide range of options available. Does the ProtectiveClean 6100 have a pressure sensor? Does the ProtectiveClean 6100 have Bluetooth? Does the 6100 come with a warranty & how long is it? Yes, it comes with a 2 year warranty. Register online at Sonicares website and get an additional 6 months of warranty. Does the ProtectiveClean 6100 have a built in timer? Sonicare claim 2 weeks. Achieved 20 days with Gum Care mode and 37 with Clean mode. The ProtectiveClean 6100’s charging station or brush head holder has not been designed to be fixed to a wall. Can I use the ProtectiveClean 6100 in the shower? Yes. A travel case is included in the box. It is too color matched to the handle. Do you own or have you used the Sonicare ProtectiveClean 6100 Series?